The Rich Firm, PC attorneys have represented numerous clients in cases involving Breach Birth. 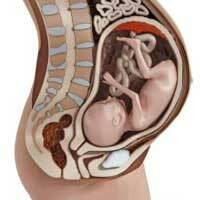 Breech presentation is not uncommon, occurring in as many as 4% of pregnancies at term. The number is much higher with prematurity, and at 28 weeks, as many as 25% of deliveries will be breech. Breech birth refers to an unusual position of the baby at birth, in which the infant presents with either feet or buttocks first, instead of the normal presentation in which the head is delivered initially. There are common potential complications of breech birth, but today we are able to recognize a breech position prior to delivery. The management of breech birth is sometimes controversial, as a risk-benefit analysis must be performed in each case. That said, the normal mode of delivery for an infant in breech presentation is through a Caesarean section, particularly in the United States. Risk factors for breech presentation include prematurity, as the fetus normally drops into position head first by the 32nd week of pregnancy. This is due to the growth in the buttocks and legs of the fetus, which cause the fetus to rotate toward the larger top portion, allowing the head to drop into the pelvis. Other risk factors include multiple gestations, congenital abnormalities, abnormalities of the uterus, and prior Caesarean section. Abnormal amounts of amniotic fluid, whether the volume is increased or reduced, occur during pregnancy and can result in malposition of the fetus. Contraction of the pelvis can influence fetal presentation, and a condition which is known as placenta previa, in which the placenta is low lying and often covers part of the cervical open (os), results in malposition. There are several positions, which characterize the different types of breech birth, and they each present unique challenges during delivery. A mother who is in labor with an infant in the breech position will experience a normal early stage, during which contractions occur regularly, and the cervix becomes dilated and effaced (it thins out). Vaginal delivery of a breech presentation requires an experienced physician who is knowledgeable about the pelvic lie and progression of the infant’s descent, allowing the physician to correctly utilize maneuvers to assist the delivery. There are obviously risks with any deviation from the normal vaginal birth, and breech presentations carry the risk of umbilical cord prolapse, which occurs when the lower pelvis is not filled by the neonate, allowing the umbilical cord to drop into the pelvis and become compressed. This is a potentially devastating complication if not handled correctly. Compression of the umbilical cord prevents flow of adequate oxygen to the fetus, and if delivery is not immediately performed, brain damage may occur within minutes. The head of the infant may become entrapped in the pelvis, due to the relatively larger head circumference of a preterm infant, compared to the buttocks, which are normally the same size as the head in a term infant. Obstetricians are trained in specific techniques, which allow them to attempt to facilitate passage of the baby’s head through the pelvic opening, but if, for example, the arm is placed along the head, there is simply not adequate room for delivery. This is a period during which the umbilical cord may be compressed for a prolonged period of time, depriving the fetus of oxygen and subsequently causing cerebral palsy or other permanent neurologic disability. Less commonly, there may be injury from decompression of the head if it passes rapidly through the pelvis as delivery is achieved. Normally, the head is slowly modeled during labor. There is a possible relationship between this head trauma and autism, although studies are in no way conclusive. During breech birth, using forceps to assist the delivery, the obstetrician may position the fetus incorrectly and cause damage to the spine or spinal cord. Forceps deliveries require an experienced obstetrician, and for this reason, many breech deliveries today are done by Caesarean section. If you have experienced problems as a result of a breech delivery, whether the delivery was performed by Caesarean section or vaginally, you may want to get a learned opinion from an outside source, particularly if your child faces a lifetime of disability from a hypoxic brain injury. There are medical doctors at The Rich Firm, PC who are available to answer your questions and to explore options to provide for those children left with significant disability after misfortune during a breech birth.